Chelsea vs. Genk : 19 October 2011. The game with Genk seemed to develop a split personality throughout the evening; all well on the pitch, but far from well off it. Parky and I left Chippenham at 4pm and we endured a crazy mix of weather as I drove eastwards towards London. There were gloomy clouds and then rain one minute, but blue skies and autumnal sun the next, with an iridescent rainbow near Swindon thrown in for good measure. Traffic slowed around Heathrow and it meant that we weren’t parked-up until 6.45pm. After all of the emotion of the CPO issues of recent weeks, the focus was now on the size of the crowd for our Champions League game with the Belgians. As I walked into The Goose, I was surprised how few people were inside. It was even quieter than for the Leverkusen game a few weeks back. Over by the bar, there was a smaller-than-usual assortment of my usual mates amongst the pub regulars. We briefly spoke about our predictions for the size of the crowd, bearing in mind the much-discussed boycott which my friend Rob had initiated around a month ago. Although I understood Rob’s reasoning for the boycott (at very least, it made the club aware of a level of discontent amongst the rank and file about a 33% increase on last season), I could not turn my back on this game. The reasons for this are varied, but I have to admit that one of the foremost reasons was that I wanted to maintain my eight year long run of consecutive home games. And by a typical quirk of fate, the game against Genk would be my 200th. I simply couldn’t stop on game 199, could I? To be fair, I spoke to Rob on Saturday about the boycott and everything was OK between us. The club, to be fair to Rob, had been forced into action by the negative publicity about the boycott and we had heard firm rumours that several thousand free tickets had been handed out to anybody with the vaguest of links to any of Chelsea’s academy teams. Call me cynical, but I was sure that the West Lower, opposite the TV cameras, would be full. The club’s inability to sell out clearly added more points to the ongoing discussions about a new stadium, too. Talk between a few of us by the bar were off all these “off-field” matters and the upcoming game was simply not discussed at all, save for confirmation that Genk had brought over a full three thousand. A few fans from Bristol, a city which is 20 miles from my home, were in the pub and I happened to bump into one of them, Tim, at the Stiff Little Fingers gig which I saw in Bath on Monday. What a small world we live in, eh? Even on a “night off”, Chelsea still manages to enter my life. It was a great gig and the two of us reminisced about Monday and previous SLF gigs, going back to 1982, when I saw the band in Bristol for the first time. There was only time for a Coke and I was then on my way. The evening air was surprisingly cold but I was well-wrapped up. As I joined the match-going crowd at Fulham Broadway, the numbers grew. I bought a match programme and made my way towards the turnstiles for the MHU. All around me were the voices of Londoners and tourists alike. “The Liquidator” was playing on the PA as I made my way to my seat. I quickly scanned to see how many were in the ground. Less empty seats in The Shed than against Leverkusen, but swathes of blue seats were visible in the top corners of the East Upper. I was sat by myself for this game. Alan, for a change, was over in the East Lower. Gary was ten seats away and there were a few familiar faces dotted around in their usual seats, but it was plainly obvious that many tourists were close by. Throughout the evening, I spotted many of them taking cheesy photographs of each other, posing with those half-and-half scarves and also the blue-and-white flags which had been placed on every third or fourth seat. Typically, I was concentrating on the size and make-up of the crowd and only really concentrated on the team just before the game kicked-off. No JT, no Mata, no bother. Torres was in – good news. After Copenhagen last season, Genk were the latest team to show up at Chelsea in a deep pink away kit. It seems to me that pink is the current flavour of the month in alternate club colours. In club rugby, too, not that rugby should really affect anything that goes on in football. About ten years ago, every team seemed to have a black away kit all of a sudden. Don’t bet against the loons at Adidas kitting us out in cerise or fuchsia by 2015. What a fantastic first-half of flowing football. On just 6 minutes, Fernando Torres narrowly beat the Genk offside trap and steadied himself before deftly poking the ball past the ‘keeper. In a moment which was all-too-reminiscent of last season, the ball touched the left-hand post and bounced away. Just after, the ball found the recalled Raul Meireles some thirty yards out. With no Genk defender closing him down, he advanced a few yards and despatched a thunderbolt into the goal. The ‘keeper must have been unsighted because he hardly moved a muscle as the ball flew past him. After the celebrations had subsided, the young Chelsea supporter to my right tore up his betting slip as he had nominated Torres as the first goal scorer. The lack of a response from anyone in the Stamford Bridge crowd made me wonder if they were, at least in part, quite correct. Yet again, our once vociferous home support went missing for virtually all of the game. At least the Chelsea players were causing me no grief. On 11 minutes, the ball was played to Frank Lampard and I spotted Torres twitching on the shoulder of the last man. “Play him in” I bellowed…Frank must have heard me as his slide-rule pass allowed Torres to advance a few yards and stroke the ball into the net. This was the quintessential New Chelsea Goal and it was a joy to witness it. Torres wheeled away down to “Celebration Corner” and was joined by his team mates. Torres’ movement was magnificent in the first quarter, in fact. He was buzzing. Despite being two goals down after only a few minutes, the away fans were – as is so typical – making all of the noise. They did their version of The Bouncy but it was very noticeable that the central section of the away fans in the upper tier of The Shed were not joining in. Down below in the lower tier, one thousand Belgians were jumping like loons and a same amount in the flanks of the upper tier, too. I guessed that the more reserved folk in the central area were the Genk equivalent of Chelsea’s Exec Club…and I wondered if letters of complaint from Mrs. Vandenblink, Miss de Vries and Mr. de Wooters were going to be addressed to the Genk club about the “noisy and boisterous” behaviour of the other fans in that section. On 27 minutes, a magnificent glancing header from Fernando Torres past the luckless Genk custodian made it 3-0. Torres was on fire and we were loving it. I was tempted to send a text to the few Liverpool fans I know saying “thanks for the goals” but thought better of it. On 32 minutes, a lovely flowing move from our defence eventually found Torres in the inside-right channel. With the merest of glances, he sent over a beautiful cross with the outside of his right foot towards a leaping Frank Lampard. Unfortunately, his jump at the near post resulted in a header which flew past the post. That would have been a goal for the ages. The Genk fans then became the latest away fans to turn in a rendition of Depeche Mode’s “Just Can’t Get Enough”, with requisite bouncing. Another flowing move soon followed, involving Torres, Lampard and Nicolas Anelka but Nico shot wide. Just before the break, on 42 minutes, we had a free-kick on the right and Malouda’s inch-perfect cross found the head of Ivanovic and his emphatic downward header made it 4-0. What a lovely way to celebrate my 200th consecutive home game (and incidentally my 850th. Chelsea game too.) I had crazy thoughts of equalling and, perhaps, surpassing the 8-0 against Wigan Athletic in 2010. No thoughts of Jeunesse Hautcharage, though…not yet, anyway. However, despite some lovely football on show, the stadium was almost devoid of sound in the home areas. It certainly seemed to me that the large proportion of tourists in The Bridge had a negative effect on the atmosphere. I tried to equate the increase in the price for a Champions League game from £30 last season to £40 this season to this reduction in the noise levels. I’m not sure if I came to any definite conclusions. However, by simply pricing out – say – 5,000 of our more established and vociferous working class fans and simply replacing them with 5,000 tourists or new fans (unaware of the Chelsea subculture) surely has to have an effect. And this is where we are as a club. The club is happy for this dilution of our traditional support and, it could be argued, possibly even encourages it. More tourists equal more Megastore sales. More match day revenue. Ker-ching. Meanwhile, thousands of our out-priced fans were watching at home on the TV. And there has to be a distinction here between overseas Chelsea supporters and just tourists. The former understand the rituals and the culture of watching our club and add to the match day experience by involving themselves in it. The latter happen to find themselves in central London on a holiday and visit Stamford Bridge out of curiosity or on a whim. It is unlikely that they add to the Chelsea experience. There were two Spanish lads to my left – nice enough lads, pleased to be at the game – but they were probably Real Madrid, Espanyol or Real Betis fans. They didn’t sing, nor clap, nor shout. And I guess there were hundreds like them dotted around the stadium. A trim Paul Elliott was escorted around the pitch by Neil Barnett at the break and “Jamaica” was given a wonderful reception, and even the away fans applauded him. A nice touch. The second-half, unfortunately, didn’t quite reach the peaks of entertainment as the first-half, despite some luscious play at times from a free-spirited Luiz and the re-born Torres. On 56 minutes, the move of the match began right on our goal-line in front of the away fans with Bosingwa winning a tackle. The ball was then played out through the midfield and Malouda raced clear only for his shot to be smothered by their ‘keeper. Still the away fans swayed, bounced and sang. 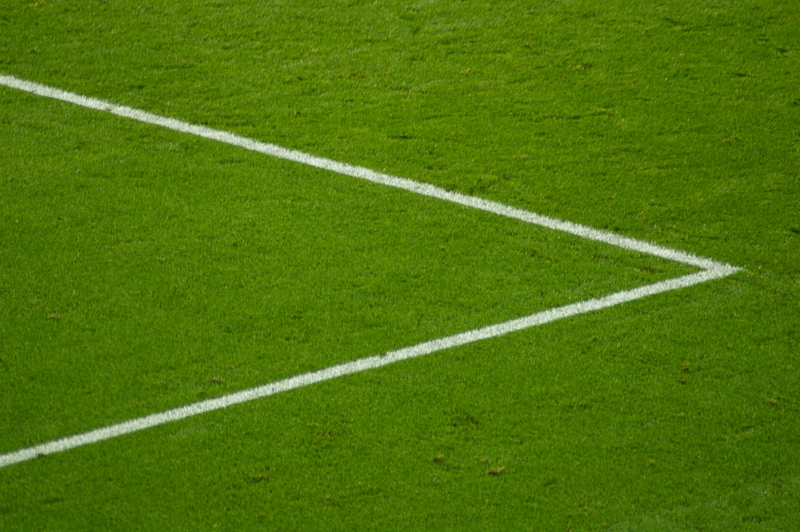 As the night progressed, I continued to take photographs of the game, though I am noting that I am finding myself taking more and more abstract photos…of corner flags, of press photographers, of shadows, of angles, of moonlit shapes on the stand roofs, of small details. On 58 minutes, a Lampard penalty shout was waved away and memories of Tom Henning Ovrebro momentarily returned. AVB replaced Lampard with Kalou on 67 minutes and I’m afraid a few negative comments were aired. I hoped he would silence the critics and he had a few stereotypical aggressive runs at the right-back. On 71 minutes, Jose Bosingwa was out wide and I shouted “go on – attack the near post, Torres” and I watched as the right-back rifled in a low cross towards Nando. His shot was blocked, but the oft-maligned Kalou was on hand to prod the ball home. The away fans then sang “Always Look On the Bright Side Of Life” and this garnered a few claps from the Chelsea fans who were still breathing. In fact, the most ironic moment came towards the end when the away fans had the temerity to hold their blue and white scarves aloft and sing “You’ll Never Walk Alone.” This caused a noisy round of booing from the home areas and was possibly the loudest the Chelsea fans had been all night. As I made my way out of the seats, I brushed past CPO director – and club historian – Rick Glanvill, who was in conversation with leading SayNoCPO campaigner Tim Rolls. We exchanged pleasantries and there was an awkward moment when I think both of us wanted to utter a few words on the CPO proposal, but we let the moment pass. Rick is a good man and I think the whole proposal must be weighing heavy on his mind. This entry was posted in Season 2011-2012. and tagged 2011-2012, Boycott, Champions League, CPO, Songs by Chris Axon. Bookmark the permalink. Great to read this after all those years. I was one of the Genk fans in the lower tier. I love your blog. Keep up the good work. Ranging from groundhops, history to remarkable players, clobber and travel. Yes I think I recognise your Word Press site. Nice one. Many thanks. It seems that a few fellow fans in Belgium had a look at this one today! They might. I shared it on the Tribune Zuid facebook page which I admin. It’s a bit like a page by the Shed End, but then the Genk equivalent. Especially your take on us singing “Chelsea supporters are w*nkers” created some good laughs.